Since 1991, Ken’s Plumbing has been providing expert plumbing services to Greenville homeowners with discriminating tastes. That's why we're Greenville's Picky People's Plumber! "Ken’s Plumbing is a top notch plumbing company. From the moment I spoke with their office until my plumbing job was complete, I knew I was working with a professional organization." Read More Testimonials | Joseph D.
Get scheduled routine maintenance, priority service, free performance tests and adjustments, and a 10% discount on all Ken's Plumbing repairs. Click to learn more and join! All too often, the “cheapest” choice becomes the most expensive choice. Many of our new customers call us to fix the problems caused by hiring the “cheap guy” the first time around—shoddy workmanship, inferior products, unlicensed and uninsured contractors... over the years, we’ve seen (and fixed) it all. 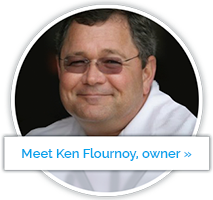 Ken Flournoy, “The Picky People’s Plumber,” opened Ken’s Plumbing Inc., in 1991 in Greenville, South Carolina. Today, Ken has an expert staff of professional plumbers (and an electrical service), who provide services to business owners and homeowners with discriminating tastes. At Ken’s Plumbing, we have your best interest at heart. Our expert technicians care about every detail and provide the highest quality plumbing services. Please give us a call at (864) 242-5511 and let us exceed your expectations!